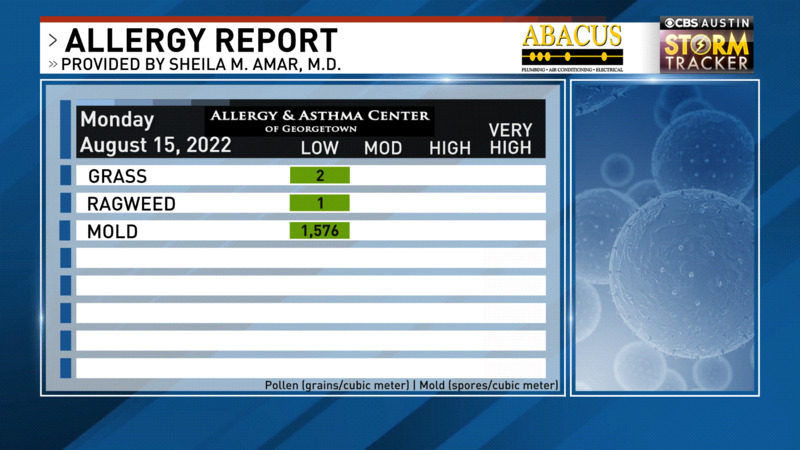 Allergy Reports provided by Allergy and Asthma Associates Monday through Friday, except on Holidays. 4/23/19 - Mold and Oak - Mod. Pecan, Cottonwood, Poplar, Grass, Privet, Birch, Willow and Sycamore - Low. 4/22/19 - Mold and Oak - Mod. Cottonwood, Pecan, Grass, Poplar, Privet, Willow, Birch, Mulberry, Sycamore and Acacia - Low. 4/19/19 - Mold, Oak, and Grass - Mod. Poplar, Pecan, Cottonwood, Birch, Sycamore, Willow, Acacia and Privet - Low. 4/17/19 - Mold, Oak and Poplar - Mod. Cottonwood, Grass, Sycamore, Willow, Birch and Privet - Low. 4/16/19 - Mold and Oak - Mod. Poplar, Pecan, Grass, Willow, Sycamore, Cottonwood, Acacia, Birch and Privet - Low. 4/15/19 - Oak - High. Mold, Poplar, Pecan and Grass - Mod. Sycamore, Willow, Cottonwood, Birch, Pecan, Hackberry, Mulberry Elm and Privet - Low. 4/11/19 - Oak - High. Mold, Grass, Poplar and Willow - Mod. Sycamore, Birch, Cottonwood, Pecan, Elm, Hackberry, Mulberry and Privet -Low. 4/10/19 - Oak - High. Mold - Mod. Willow, Poplar, Grass, Sycamore, Birch, Elm, Cottonwood, Pecan, Hackberry, Mulberry and Privet - Low. 4/8/19 - Oak - High. Mold, Poplar, Mulberry and Willow - Mod. Elm, Ash, Birch, Hackberry, Privet, Cottonwood and Grass - Low. 4/4/19 - Oak - High. Mold, Sycamore, Poplar, Willow, Mulberry, Ash, and Elm - Mod. Birch, Cottonwood, Grass, Hackberry, Pecan, Privet and Acacia - Low. 4/2/19 - Oak - High. Mold, Poplar, Sycamore, Elm, and Ash - Mod. Grass, Willow, Birch, Cottonwood, Mulberry, Hackberry, Pecan and Privet - Low. 4/1/19 - Oak - high. Mold, Sycamore, Willow, Elm, Poplar, Grass and Ash - Mod. Birch, Cottonwood, Mulberry, Hackberry, Pecan and Cedar - Low. 3/28/19 - Oak - High. Mold, Elm, Willow, Sycamore, Cottonwood, Ash, and Grass - Mod. Mulberry, Hackberry, Birch, Pine and Cedar - Low. 3/27/19 - Oak - High. Mold, Elm, Willow, Sycamore, Grass, Cottonwood, and Ash - Mod. Poplar, Hackberry, Mulberry, Birch and Privet - Low. 3/22/19 - Mold 1721 - Mod. Oak 876 - High. Hackberry 221 - Mod. Elm 166 - Mod. Sycamore 144 - Mod. Ash 116 - Mod. Willow 102 - Mod. Cottonwood 94 - Mod. Grass 83 - Mod. Mulberry 55 - Mod. Poplar 33 - Low. Traces of Privet. 3/21/19 - Mold 879 - Mod, Oak 1103 - High. Sycamore 106 - Mod. Hackberry 104 - Mod. Willow 97 - Mod. Elm 83 - Mod. Ash 79 - Mod. Cottonwood 73 - Mod. Grass 69 - Mod. Mulberry 36 - Low. Poplar 27 - Low. Traces of Privet and Pecan. 3/20/19 - Mold 650 Mod. Oak 923 - High. Hackberry 182 - Mod. Ash 155 - Mod. Willow 108 - Mod. Elm 102 - Mod. Grass 86 - Mod. Sycamore 83 - Mod. Cottonwood 61 - Mod. Poplar 44 - Low. Mulberry 22 - Low. Traces of Pecan, Cedar, Pine and Privet. 3/19/19 - Mold 1032 - Mod. Oak 531 - High. Ash 111 - Mod. Hackberry 85 - Mod. Elm 80 - Mod. Pine 58 - Mod. Cottonwood 47 - Low. Willow 39 - Low. Mulberry 39 - Low. Sycamore 33 - Low. Traces of Grass, Birch and Poplar. 3/18/19 - Mold 1109 - Mod. Oak 218 - Mod. Hackberry 88 - Mod. Elm 44 - Low. Ash 30 - Low. Willow 22 - Low. Traces of Poplar, Grass, Cedar, Cottonwood, Sycamore and Mulberry. 3/15/19 - Mold 3021 - High. Oak 398 - High. Elm 158 - Mod. Ash 52 - Mod, Hackberry 47 - Low. Cottonwood 44 - Low. Willow 44 - Low. Poplar 39 - Low. Traces of Sycamore, Grass, Mulberry and Walnut. 3/14/19 Mold 1682 - Mod. Oak 196 - Mod. Elm 72 - Mod. Ash 44 - Low. Poplar 36 - Low. Cottonwood 25 - Low. Willow 22 - Low. Traces of Sycamore, Hackberry and Grass. 3/13/19 Mold -2179 Mod. Oak 122 - Mod. Elm 64 - Mod. Ash 47 - Low. Poplar 30 - Low. Cottonwood 22 - Low. Hackberry 19 - Low. Willow 17 - Low. Traces of Sycamore and Grass. 3/12/19 - Mold 3250 - high. Oak 11 - mod. Elm 44 - low. Willow 25 - low. Hackberry 19 - low. Ash 17 - low. Trace Cottonwood, Poplar, Grass, Cedar and Sycamore. 3/8/19 - Mold 1147 - mod. Willow 33 - low. Sycamore 25 - low. Hackberry 19 - low. Trace Cedar, Grass, Elm, Ash, Poplar and Cottonwood. 3/6/19 - Mold 841 - mod. Oak 41 - low. Cedar 27 - low. Trace Willow, Cottonwood, Elm, Grass, Ash. 3/5/19 - Mold 765 - mod. Cedar 50 - mod. Oak 44 - low. Elm 19 - low. Trace Grass, Hackberry, Willow, Poplar and Ash. 3/4/19 - Mold 510- mod. Oak 41 -low. Cedar 27 - low. Elm 15 - low. Traces of Ash, Hackberry, Willow and Grass. 3/1/19- mold 2791 - mod. Oak 44 - low. Trace Cedar and Willow. 2/21/19 - Mold 1452 - mod. Oak 97 - mod. Ash 25 - low. Elm 19 - low. Trace Cottonwood and Willow. 2/20/19 - Mold 1224 - mod. Trace Cedar, Elm, Oak, Willow. 2/19/19 - Mold 956 - mod. Oak 41 - low. Elm 22 - low. Trace Cottonwood, Ash, Birch, Willow. 2/18/19 - Mold 1567 - mod. Oak 188 - mod. Elm 88 - mod. Ash 66 - mod. Cedar 47 - low. Cottonwood 39 - low. Willow 25 - low. Trace Poplar and Birch. 2/14/19 - Mold 2371 - mod. Oak 171 - mod. Ash 102 - mod. Elm 91 - mod. Trace Cedar, Willow and Poplar. 2/13/19 - Mold 2791 - mod. Elm - low. Oak 39 - low. Ash 22 - low. Trace Cedar and Willow. 2/12/19 - Mold 6424 - high. Elm 41 - low. Oak 22 - low. Trace Ash and Cedar. 2/11/19 - Mold 1071 - mod. Elm 97 - mod. Ash 58 - mod. Cedar 47 - low. Oak - low . Trace of Willow and Acacia. 2/8/19 - Mold 2562 - moderate. Ash 83 - mod. Oak 75 - mod. Cedar 55 - mod. Trace Willow. 2/7/19 - Mold 2600 - moderate. Ash 171 - moderate. Oak 147 - moderate. Cedar 135 - moderate. Elm 127 - moderate. Willow 30 - light. Trace Acacia. 2/6/19 - Mold 4397 - high. Elm 198 - mod. Ash 94 - mod. Cedar 72 - mod. Oak 55 - mod. Willow 28 - low. Trace Acacia. 2/5/19 - Mold 3288 - high. Elm 61 - mod. Cedar 39 - low. Ash 30 - low. Willow 25 - low. Trace Oak and Acacia. 2/4/19 - Mold 1453 - mod. Elm 41 - low. Trace Cedar, Ash, Oak. 2/1/19 - Mold 1721 - mod. Elm 30 - low. Trace Ash, Cedar and Oak. 1/30/19 - Mold 2791 - mod. Elm 44 - low. Cedar 22 - low. Trace Ash, Oak and Willow. 1/29/19 - Mold 3135 - high. Elm 64 - mod. Cedar 30 - low. Trace Ash, Oak, Willow. 1/28/19 - Mold 1988 - mod. Elm 30 - low. Cedar 24 - low. Trace Oak and Willow. 1/25/19 - Mold 3126 - high. Cedar 43 - mod. Trace Elm, Oak, Willow. 1/24/19 - Mold 1206 - mod. Cedar 62 - mod. Elm 21 - low. Trace Oak, Willow, Pine, Acacia, Ash. 1/23/19 - Mold 1109 - mod. Cedar 67 - mod. Elm 19 - low. Trace Ash, Oak, Willow, Pine, Acacia. 1/22/19 - Mold 2103 - mod. Cedar 30 - low. Elm 22 - low. Trace Ash, Willow, Oak. 1/21/19 - Mold 2343 - mod. Cedar 71 - mod. Elm 25 - low. Trace Oak, Ash, Acacia, Willow, Privet. 1/18/19 - Mold 1185 - mod. Trace of Cedar and Elm. 1/16/19 - Cedar 33 - low. Mold 2141 - mod. 1/15/19 - Cedar 39 - low. Mold 1682 - mod. 1/14/19 - Cedar 64 - mod. Mold 1567 - mod. 1/11/19 - Cedar 53 - mod. Mold 2179 - mod. 1/10/19 - Cedar 111 - mod. Mold 1644 - mod. 1/9/19 - Cedar - 1048 high. Mold 3212 - high. 1/8/19 - Cedar 188 - mod. Mold 3409 - high. 1/7/19 - Cedar 1146 - high. Mold 497 - low. 1/4/19 - Cedar 64 - mod. Mold 1759 - mod. 1/3/19 - Cedar 27 - low. Mold 421 - low. 1/2/19 - Cedar 29 - low. Mold 784 - mod. 12/31/18 - Cedar 67 - mod. Mold 663 - mod. 12/28/18 - Cedar 675 - high. Mold 1224 – mod. 12/27/18 - Mold 1682 – mod. Trace cedar. 12/26/18 - Cedar 4385– very high. Mold 1720 – mod. 12/21/18 - Cedar 9903 - very high. Mold 1147 - mod. 12/20/18 - Cedar 1742 - high. Mold 879 - mod. 12/19/18 - Cedar 406 - high. Mold 1606 - mod. 12/18/18 - Cedar 1131 - high. Mold 1070- mod. 12/17/18 - Cedar 3531 - high. Mold 739 - mod. 12/14/18 - Cedar 4880 - high. Mold 1529 – mod. Trace Red Berry Juniper. 12/13/18 - Mold 1224 -- mod. Cedar 232 - mod. Red Berry Juniper 47 - low. 12/12/18 - Mold 955 - mod. Red Berry Juniper 66 - mod. Cedar 25 - low. 12/11/18 - Mold 1529 - mod. Red Berry Juniper 33 - low. 12/10/18 - Mold 1007 - mold. Trace Red Berry Juniper. 12/7/18 - Mold 1797 - mod. Trace Red Berry Juniper. 12/6/18 - Mold 2179 mod. Red Berry Juniper 39 - low. 12/5/18 - Mold 2485 mod. Red Berry Juniper 61 - mod. 12/4/18 - Mold 3326 - high. Red Berry Juniper 135 - mod. 12/3/18 - Mold 3938 - high. Red Berry Juniper 59 - mod. 11/30/18 - Mold 2409 - mod. Red Berry Juniper 25 - low. 11/29/18 - Mold 2753 - mod. Red Berry Juniper 58 - mod. 11/28/18 - Mold 2294 - mod. Red Berry Juniper 61 - mod. 11/27/18 - Mold 2141 - mod. Red Berry Juniper 56 - mod. 11/26/18 - Mold 3594 - high. Red Berry Juniper 76 - mod. 11/21/18 - Mold 3976 - high. Red Berry Juniper 119 - mod. 11/20/18 - Mold 3411 - high. Red Berry Juniper 80 - mod. 11/19/18 - Mold 2587 - mod. Red Berry Juniper 62 - mod. 11/16/18 - Mold 3938 - high. Red Berry Juniper 58 - mod. 11/14/18 - Mold 2371 - mod. Red Berry Juniper 72 - mod. 11/13/18 - Mold 2332 - mod. Red Berry Juniper 44 - low. 11/12/18 - Mold 4664 – high. Red Berry Juniper 103 – mod. Trace Ragweed. 11/9/18 - Mold 4856 - high. Red Berry Juniper 88 - mod. Trace Ragweed. 11/8/18 - Mold 5124 - high. Red Berry Juniper 39 - low. Trace Ragweed and Marsh Elder. 11/7/18 - Mold 3785 - high. Trace Ragweed and Red Berry Juniper. 11/6/18 - Mold 4091 - high. Trace Ragweed and Red Berry Juniper. 11/5/18 - Mold 4537 - high. Red Berry Juniper 25 - low. Trace Ragweed and Pigweed. 11/2/18 - Mold 3479 - high. Red Berry Juniper 33 - low. Trace Pigweed and Ragweed. 10/30/18 - Mold 4435 - high. Red Berry Juniper 39 - low. Ragweed 17 - low. Trace Pigweed and Fall Elm. 10/29/18 - Mold 5582 - mod. Red Berry Juniper 91 - mod. Ragweed 53 - mod. Fall Elm 19 - low. Trace Pigweed. 10/26/18 - Mold 6538 - high. Red Berry Juniper 122 - mod. Fall Elm 29 - low. Ragweed 22 - low. Trace Marsh Elder. 10/24/18 - Mold 9750 - very high. Ragweed 53 - mod. Fall Elm 30 - low. Trace Marsh Elder. 10/23/18 - Mold 8182 - very high. Fall Elm 47 - low. Ragweed 27 - low. Trace Grass and Marsh Elder. 10/22/18 - Mold 5621 - high. Fall Elm 49 - low. Ragweed 29 - low. Trace Grass and Marsh Elder. 10/19/18 - No count due to equipment maintenance. 10/18/18 - No count due to equipment maintenance. 10/17/18 - No count due to equipment maintenance. 10/16/18 - Mold 2179 - mod. Ragweed 28 - low. Trace Fall Elm and Pigweed. 10/15/18 - Mold 5314 - high. Ragweed 162 - mod. Fall Elm 70 - mod. Pigweed 17 - low. Trace Marsh Elder and Grass. 10/12/18 - Mold 4129 - high. Fall Elm 53 - mod. Ragweed 96 - mod. Trace Marsh Elder and Pigweed. 10/10/18 - Mold 1835 - mod. Ragweed 19 - low. Trace Grass and Fall Elm. 10/9//18 - Mold 2179 - mod. Ragweed 36 - low. Fall Elm 17 - low. Trace Marsh Elder and Pigweed. 10/8/18 - Mold 4958 - high. Ragweed 158 - mod. Fall Elm 50 - low. Marsh Elder 21 - low. Trace Grass & Pigweed. 10/3/18 - Mold 2065 - mod. Ragweed 19 - low. Trace Fall Elm. 10/2/18 - Mold 2332 - mod. Ragweed 25 - low. Trace Fall Elm and Marsh Elder. 10/1/18 - Mold 6385 - high. Ragweed 54 - mod. Fall Elm 28 - low. Marsh Elder 17 - low. Trace Pigweed and Grass. 9/28/18 - Mold 4299 - high. Fall Elm 112 - mod. Ragweed 42 - low. Marsh Elder 22 - low. Trace Pigweed and Grass. 9/26/18 - Mold 4588 - high. Fall Elm 28 - low. Ragweed 28 - low. Trace Marsh Elder. 9/25/18 - Mold 5047 - high. Fall Elm 22 - low. Ragweed 19 - low. Trace Marsh Elder and Grass. 9/18/18 - Mold 9712 - very high. Fall Elm 158 - mod. Ragweed 33 - low. Trace Pigweed. 9/17/18 - Mold 7150 - high. Fall Elm 274 - mod. Ragweed 47 - low. Trace Pigweed and Marsh Elder. 9/12/18 - Mold 12,809 - very high. Fall Elm 25 - low. Trace Ragweed. 9/11/18 - Mold 9024 - very high. Trace Fall Elm, Ragweed, Pigweed. 9/10/18 - Mold 4690 - high. Fall Elm 40 - low. Ragweed 19 - low. Trace Marsh Elder. 9/7/18 - Mold 5162 - high. Fall Elm 19 - low. Marsh Elder 36 - low. Ragweed 25 - low. 9/6/18 - Mold 5363 - high. Marsh Elder 41 - low. Ragweed 33 - low. Fall Elm 22 - low. Trace Pigweed. 9/5/18 - Mold 5282 - high. Ragweed 33 - low. Marsh Elder 30 - low. Fall Elm 25 - low. 9/4/18 - Mold 4990 - high. Trace Fall Elm, Ragweed, Marsh Elder. 8/31/18 - Mold 3555 - high. Trace Fall Elm, Ragweed, Pigweed. 8/30/18 - Mold 4091 - high. Trace Ragweed, Pigweed, Fall Elm, Marsh Elder. 8/29/18 - Mold 3441 - high. Trace Pigweed, Ragweed, Fall Elm. 8/28/18 - Mold 2409 - moderate. Trace Fall Elm, Grass. 8/27/18 - Mold 3977 - high. Trace Fall Elm, Ragweed, Pigweed, Grass. 8/22/18 - Mold 2065 - moderate. Fall Elm 19 - low. Trace Ragweed and Pigweed. 8/20/18 - Mold 2912 - moderate. Fall Elm 64 - mod. Grass 22 - low. 8/14/18 - Mold 4091 - high. 8/13/18 - Mold 3326 - high. Trace Pigweed and Fall Elm. 8/10/18 - Mold 2485 - moderate. Trace Fall Elm. 8/9/18 - Mold 4052 - high. Trace Fall Elm. 8/8/18 - Mold 4550 - high. Trace Fall Elm and Pigweed. 8/7/18 - Mold 2562 - moderate. Trace Fall Elm, Marsh Elder, Grass. 8/6/18 - Mold 4454 - high. Fall Elm 17 - low. Trace Pigweed. 8/3/18 - Mold 5621 - high. Grass 53 - mod. Trace Fall Elm. 8/2/18 - Mold 3212 - high. Grass 53 - mod. Trace Fall Elm, Pigweed. 7/31/18 - Mold 4347 - high. Grass 75 - mod. Trace Fall Elm, Pigweed. 7/30/18 - Mold 5888 - high. Grass 27-low. Trace Fall Elm, Pigweed. 7/26/18 - Mold 3365 - high. Grass 44 - low. 7/25/18 - Mold 4282 - high. Grass 50 - mod. Trace Pigweed. 7/24/18 - Mold 3212 - high. Grass 39 - low. Trace Pigweed. 7/23/18 - Mold 1325 - mod. Grass 40 - low. Trace Pigweed. 7/20/18 - Mold 2256 - mod. Grass 41 - low. Trace Pigweed. 7/19/18 - Mold 3403 - high. Grass 36 - low. Trace Pigweed. 7/18/18 - Mold 4359 - high. Grass 28 - low. Trace Pigweed. 7/16/18 - Mold 3288 - high. Grass 41 - low. 7/10/18 - Mold 17,741 - very high. Trace Grass. 7/2/18 - Mold 4129 - high. Grass 19 - low. Trace Hackberry, Pigweed, Willow, Pecan, Mulberry, Ragweed. 6/29/18 - Mold 4856 - high. Grass 22 - low. Trace Hackberry, Mulberry, Pigweed, and Privet. 6/28/18 - Mold 3862 - high. Grass 25 - low. Trace Pigweed, Willow, Hackberry, and Privet. 6/27/18 - Mold 3518 - high. Grass 19 - low. Trace Privet, Ragweed. 6/26/18 - Mold 4283 - high. Grass 22 - low. Trace Willow, Mulberry, Pigweed, and Privet. 6/25/18 - Mold 5907 - high. Grass 24 -low. Trace Willow, Ragweed, Pigweed, Pecan, Hackberry, Mulberry. 6/21/18 - Mold 10362 - very high. Trace Grass and Pecan. 6/20/18 - Mold 9176 - very high. Trace Grass, Pecan. 6/19/18 - Mold 3479 - high. Trace Grass, Pecan, Poplar, and Willow. 6/18/18 - Mold 2880 - moderate. Grass 16 - low. Trace Pecan, Poplar, Privet, Ragweed, Willow. 6/15/18 - Mold 1685 - moderate. Grass 17 - low. Trace Poplar, Pecan, Privet, and Pigweed. 6/14/18 - Mold 1874 - moderate. Trace Grass, Poplar, Hackberry, Willow and Pecan. 6/13/18 - Mold 1338 - moderate. Grass 25 - low. Trace Poplar, Pecan, Mulberry, and Ragweed. 6/12/18 - Mold 1797 - moderate. Grass 39 - low. Trace Pecan, Willow, Privet, Poplar, and Ragweed. 6/11/18 - Mold 1045 – moderate. Grass 17 – low. Trace Pecan, Poplar, Privet, Pigweed, Ragweed, Mulberry, Acacia. 6/8/18 - Mold 4894 - high. Trace Grass, Pecan and Willow. 6/7/18 - Mold 2371 - mod. Trace Grass, Pecan and Willow. 6/6/18 - Mold 2026 - mod. Grass 19 - low. Trace Pecan, Privet, and Poplar. 6/5/18 - Mold 5009 - high. Grass - 17 low. Trace Poplar, Willow, and Privet. 6/4/18 - Mold 3187 - high. Trace Poplar, Grass, Privet, Pecan, Willow, Elm, and Oak. 6/1/18 - Mold 3747 - high. Grass 55 - mod. Trace Privet, Willow, Poplar, Hackberry, and Ragweed. 5/31/18 - Mold 4053 - high. Grass 50 - mod. Trace Poplar, Privet, Willow, Ragweed, Pigweed and Pecan. 5/30/18 - Mold 2103 - mod. Grass 28 - low. Poplar 17 - low. Trace Privet and Willow. 5/29/18 - Mold 2154 - mod. Grass 54 - mod. Trace Hackberry, Pecan, Willow, Poplar, Ragweed, Privet and Pigweed. *There will be NO allergy report on Memorial Day since the Allergy clinic will be closed for the holiday. 5/24/18 - Mold 2714 - mod. Grass 19 - low. Trace: Privet, Poplar, Pecan, Willow, and Ragweed. 5/23/18 - Mold 2026 - mod Trace: Grass, Pecan, and Poplar. 5/22/18 - Mold 3059 – high. Grass 19 – low. Trace: Pecan, Poplar, Privet, Willow and Oak. 5/9/18 - Mold 4091 - high. Pecan 83 - mod. Grass 30 - low. Trace Mulberry, Oak, Poplar, Privet, Sycamore, Willow. 5/8/18 - Mold 3862 - high. Pecan 91 – mod. Grass 33 – low. Oak 19 – low. Trace Willow, Mulberry, Poplar, Sycamore, Privet. 5/7/18 - Mold 5238 - high. Pecan 50 - mod. Grass 47 - low. Oak 30 - low. Sycamore 16 - low. Trace Hackberry, Mulberry, Privet, Poplar, Willow, Cottonwood. 5/4/18 - Mold 1721 - mod. Pecan 171 - mod. Grass 30 - low. Oak 22 - low. Trace Willow, Cottonwood, Poplar, Elm and Ragweed. 5/3/18 - Mold 2217 - mod. Pecan 235 - mod. Grass 55 - mod. Oak 44 - low. Trace Cottonwood, Poplar, Sycamore, Willow, Walnut, and Privet. 5/2/18 - Mold 1147 - mod. Pecan 122 - mod. Grass 69 - mod. Oak 47 - low. Trace Cottonwood, Hackberry, Mullberry, Poplar and Privet. 5/1/18 - Mold 2391 – mod. Grass 64 – mod. Oak 25 – low. Trace Cottonwood, Hackberry, Mulberry, Privet and Poplar. 4/30/18 - Mold 2791 - mod. Oak 64 - mod. Grass 33 - low. Pecan 28 - low. Willow 28 - low. Sycamore 25 - low. Cottonwood 25 - low. Privet 22 - low. Trace Mulberry, Hackberry, Ash. 4/25/18 - Mold 1224 - mod. Oak 22 - low. Grass 25 - low. Pecan 22 - low. Trace Poplar, Willow, Cottonwood and Sycamore. 4/24/18 - Mold 726 - mod. Oak 72 - mod. Grass 36 - low. Sycamore 22 - low. Trace Elm, Hackberry, Mulberry, Poplar, Willow, Pecan. 4/23/18 - Mold 803 - mod. Oak 61 - mod. Grass 33 - low. Trace Poplar, Hackberry, Willow, Sycamore, Pecan. 4/20/18 - Mold 421 – mod. Oak 28 – low. Grass 22 – low. Trace Hackberry, Pecan, Mulberry, Poplar, Willow. 4/19/18 - Mold 574 - low. Oak 83 - mod. Grass 25 - low. Pecan 19 - Low. Trace: Poplar, Elm, Hackberry, Willow and Sycamore. 4/18/18 - Mold 1682 - mod. Oak 94 - mod. Grass 33 - low. Pecan 33 - Low. Poplar 22 - Low. Sycamore 22 - Low. Cottonwood 19 - Low. Trace: Elm, Hackberry, Mulberry and Willow. 4/17/18 - Mold 2562 – mod. Oak 285 – mod. Poplar 41 – low. Pecan 39 – low. Grass 30 – low. Sycamore 25 – low. Trace: Cottonwood, Elm, Ash, Hackberry, Mulberry and Willow. 4/16/18 - Mold 994 – mod. Oak 1111 – high. Grass 108 – mod. Poplar 97 – mod. Sycamore 85 – mod. Cottonwood: 47 – low. Willow 47 – low. Mulberry 22 – low. Hackberry 19 – low. Pecan 19 – low. Trace Ash, Birch, Walnut.